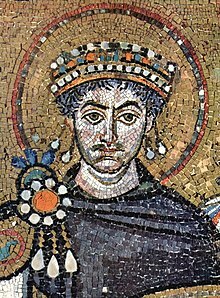 Justinian I (/dʒʌˈstɪniən/) (Latin: Flavius Petrus Sabbatius Iustinianus Augustus, Greek: Φλάβιος Πέτρος Σαββάτιος Ἰουστινιανός) (c. 482 – 14 November 565), commonly known as Justinian the Great, was Eastern Roman Emperor from 527 until his death. He is considered a saint by Eastern Orthodox Christians. Justinian simplified Roman laws. These are now called Corpus Juris Civilis. This page was last changed on 13 August 2018, at 02:59.